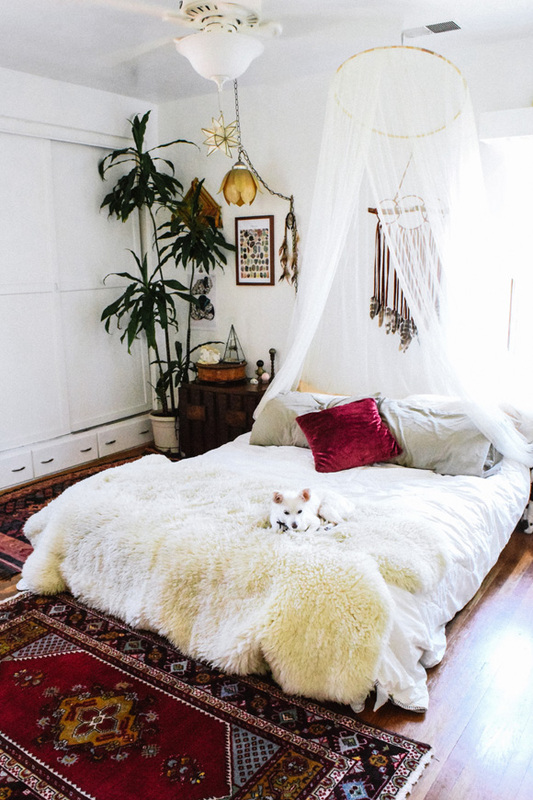 Boho Design Ideas To Inspire An Instantly More Creative Home! 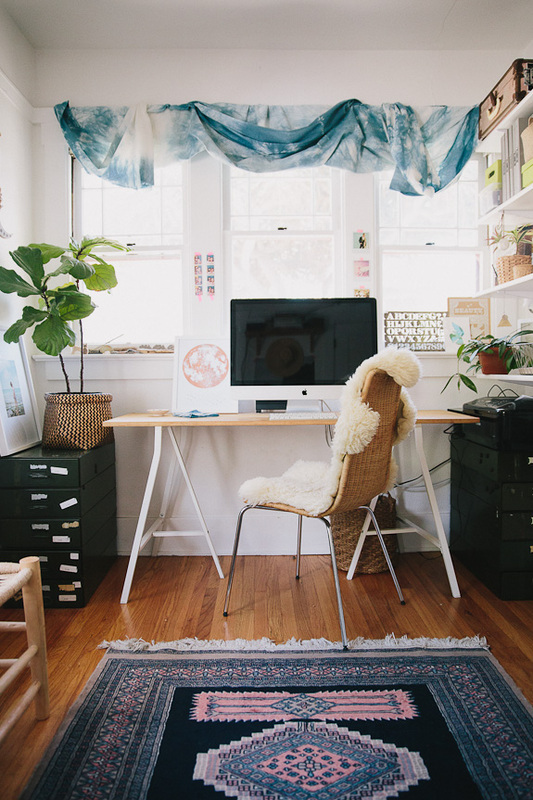 Boho design is so intriguing when it’s uncluttered and yet so lush. There’s a sense of the handmade. There’s a feeling of nature. There’s imperfect perfection. There’s lots of happiness. There’s a softness that triggers welcome in your brain and body. There’s ease. There’s retreat. 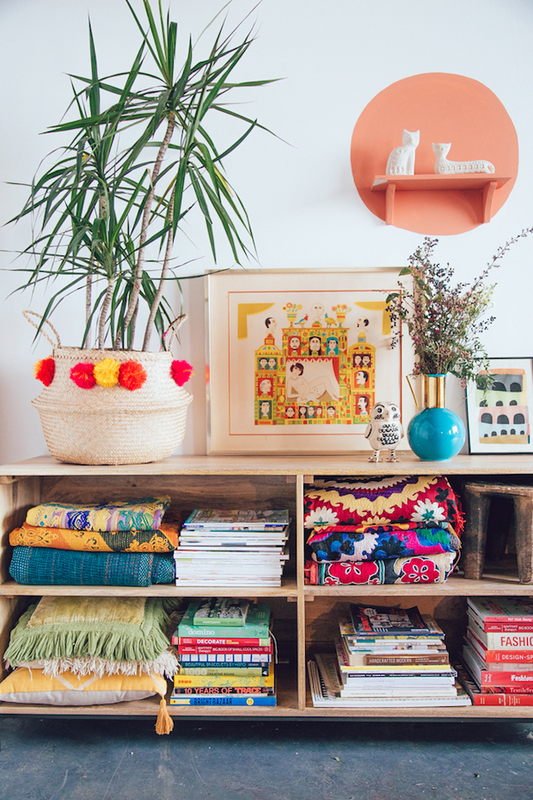 And today’s boho inspiration is all about making your space more instantly creative… even if you’re not a boho styling person, but especialy if you are! Softest sofa. 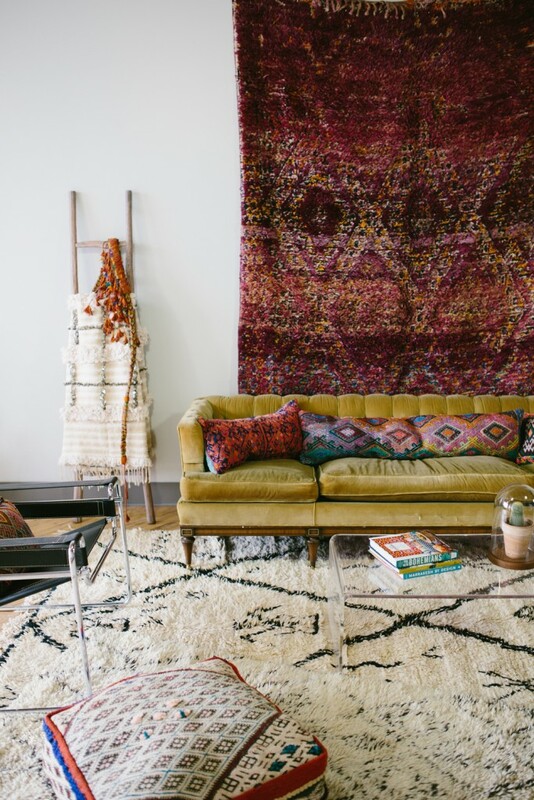 Rugs on the walls as shown above are the ultimate in texture. But what’s a standout is the velvety sofa that anyone can try in their own way. A softer sofa, or some softer (but not overwhelming) pillows create a space that’s sink-into-able. Dream catching details. Whether it’s a dreamcatcher, a simple canopy or that one pillow that lights up your bed in color, very deliberate details make spaces come to life. Super-special curtains. Whether rolled up like clouds, tied back in ribbons or hand dyed (it’s so easy) in favorite colors, curtains are a show-stopping way to light up a space. Let the wilds grow in unexpected places. 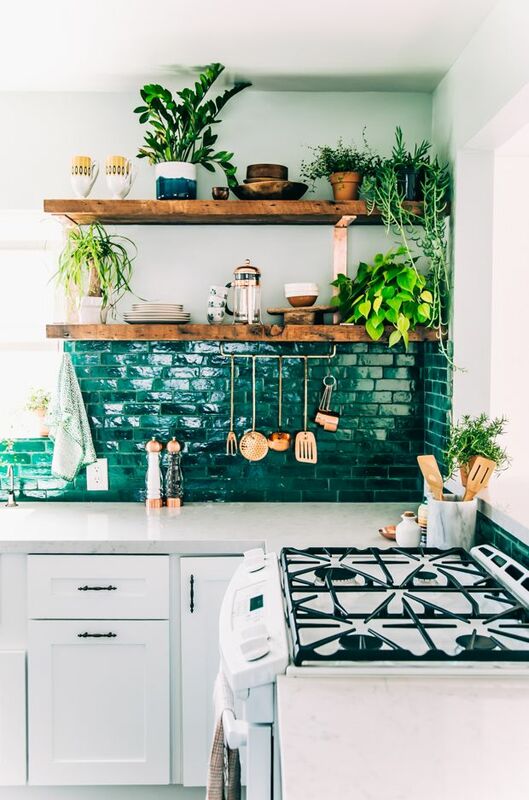 Doorways, dark corners, shelves, hanging from structural beams, kitchens, bathrooms… I just plotted my next huge array of plants in the kitchen and I couldnt be more thrilled! What about your textured walls? 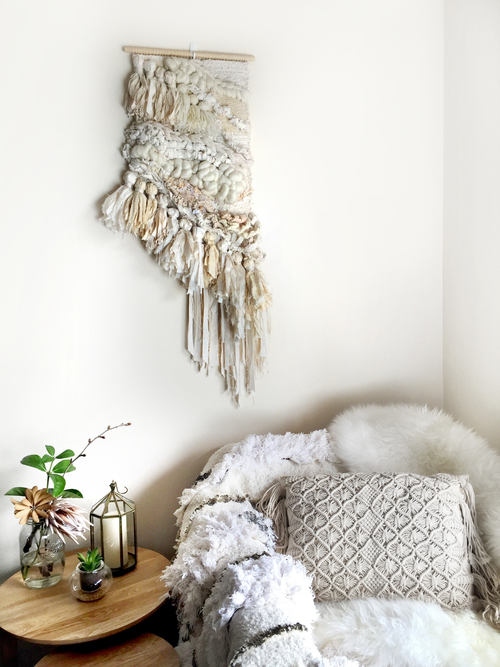 Wall hangings, tapestries, yarn art, crafts turned to displays… I’m re-designing my own walls right now to have way more texture where the space needs a lift. All of this instant inspiration is just a jumping off point for you. The idea of it all is looking at your space as a more big-picture type of all-encompassing canvas that you can design with lots of grounded gorgeousness. It will keep your mind engaged. It will keep your life feeling fresh. You can remix, repurpose and change things when you need a shift in perspective. Always refreshing and full of grace and beauty!!! The Meditative Moments That Can Transform Your Days! Clutter Clearing To Live Your Best Life!!! 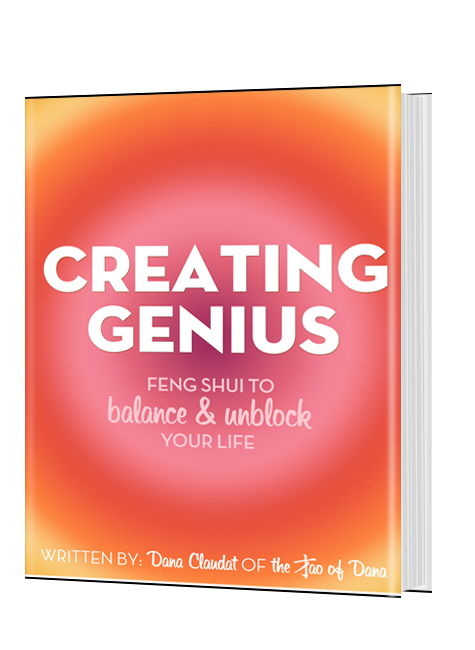 Previous post: Are There Lies Lingering In Your Life And Creating Huge Problems? Next post: Bulletproof Matcha Smoothie Bowl!